My current long-term project. Silent Earth is a vertical missile defense game about a strange piece of software, featuring nail-biting action-strategy gameplay, gorgeous vector art and a lush, generative soundtrack. Remote Games’ first project, slated for release in 2018. Ludum Dare 38 entry. A screaming fast, hyperkinetic shooter about going as fast as you can and racking up massive combos! Play it on my Itch page. Microcosm Originally made for 0hgame and later refined, Microcosm is an experiment in gameplay designed in service to music and an attempt at circular framing. Drift through a tiny endless ocean and absorb (or don’t) other cells to get bigger. You can get it on my Itch page. Music by Inemuri. Blink Blink was originally made for Ludum Dare 35. A reckless oddball mashup of Hyper Light Drifter‘s dashing mechanic and the binary colors of Ikaruga, the resulting gameplay feels just as frenetic as it is rhythmic. You can play it in your browser here. (Use a controller!) Music and graphics by Flite. 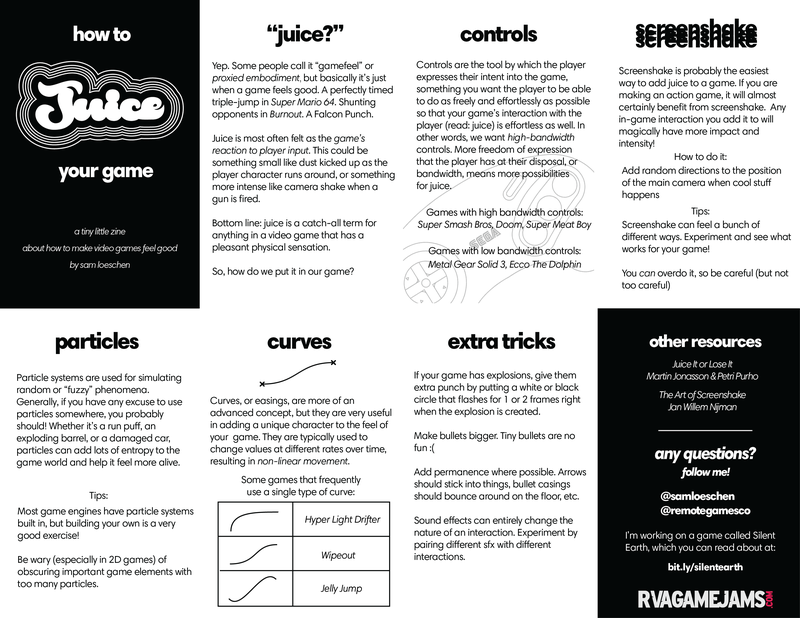 How To Juice Your Game This is a zine I made for Richmond Zine Fest about juice/gamefeel. 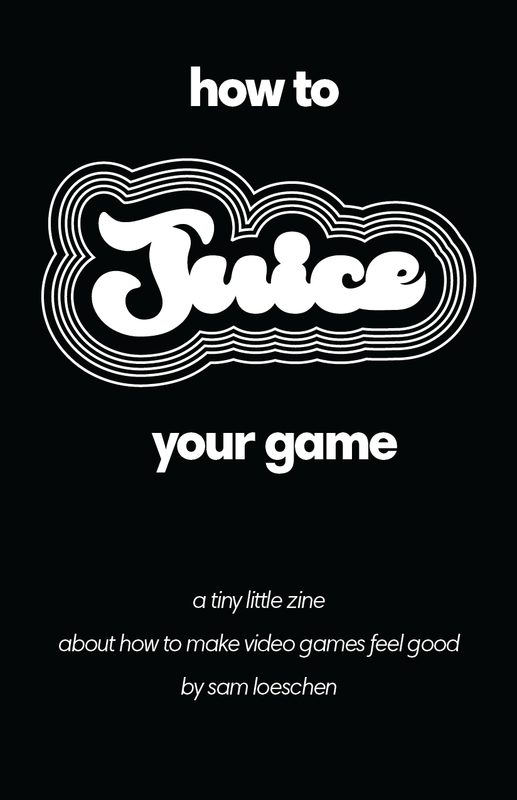 It’s more or less the material of Juice It or Lose It by Petri Purho or The Art of Screenshake by Jan Willem Nijman put into zine form, with some of my own ideas. Web-readable version here, printable version here. This is one of the first explorations I’ve made in PICO-8, and is inspired by Adam Saltsman’s Capsule.